Started with 5 x7 card base then matted with gold cardstock, cut out white mat which I die cut the Gemini Lyra die, used as the negative. Placed white mat over the gold cardstock. Added roman clock on the right side with some glitter. Gold glitter sentiment inside the clock. At the bottom of the clock are Poinsettia's with gold snowflakes in the middle and glitter on the leaves. Just BEAUTIFUL Bernie! 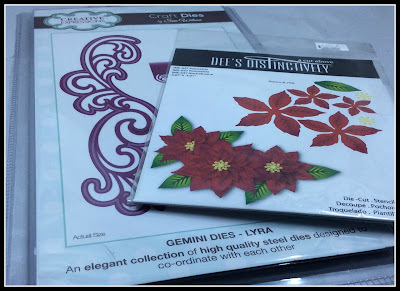 Love your use of dies and the design is exquisite! Awesome inspiration ... thanks! 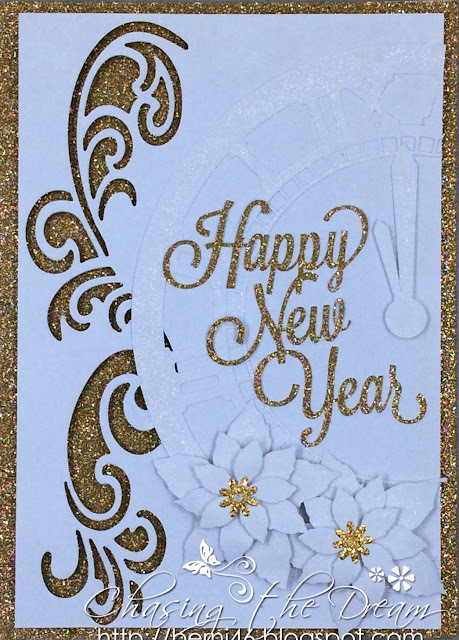 What a great New Year's card with the clock and the design to the left that could be fireworks. Love your white and gold together. Whoa Berni, that is totally stunning! Love those white poinsettias. Happy New Year to you!! A cleverly designed card, I love the gold showing through! oh so pretty! the gold and white are a great combination!